My last attempt at an HTL didn’t go very well. In fact, the whole experience, from training to completing the Heavy to quitting the HTL, was so mentally and emotionally exhausting that I had a hard time getting back to rucking. I did one event 3 months after my failed HTL attempt and the results were less than stellar. After that event, I didn’t ruck for 3 months. My head was (is?) kind of messed up. Over the months I took time to get back into my barbell strength training and doing more Crossfit classes. It was kind of nice to not be putting in miles on miles and carrying logs, sandbags, and that stupid jerry can. But, there were moments when I missed rucking and GORUCK. Those moments usually came when I would talk to someone about it. A random person would ask about that weird thing I do that’s like 24 hours or something. I’d begin talking and realize I had a smile on my face. Something in me still wanted to suffer. But, those moments were few and far between. 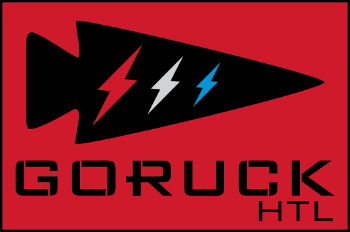 I mostly just thought I might be done with rucking and GORUCK. But there was a problem. I had already signed up for the GOREV Heavy in Philly. Click to check out GOREV! I can’t remember how the whole situation went down, but I know that there was a coupon code and my buddy Paul involved. Even if I wanted to quit, I had paid the coin for this event and there was a sense of obligation to do it. But, again, my mind teetered back and forth. I thought about just giving away my registration here, on the website. But, it happened again. A coupon code showed up. I looked at it for an entire week. I put the events in my cart and then deleted them. Did I really want to do this? Yes. No. No. I don’t know. Then a moment of clarity hit. A buddy asked me about the 9/11 event I did and my failed HTL. As I recounted the event, I had clarity. It was an experience like no other. I wanted to do it again. I signed up for the GOREV Tough and Light. 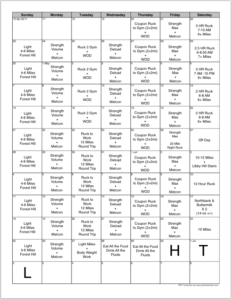 With a little over 2 months before the event, I threw together a training plan. While it will get me a lot of training miles, it will probably be significantly less than my last go around. Also, my plan is a lot simpler than my last HTL training plan. I’ve included a copy of it here for you to see. 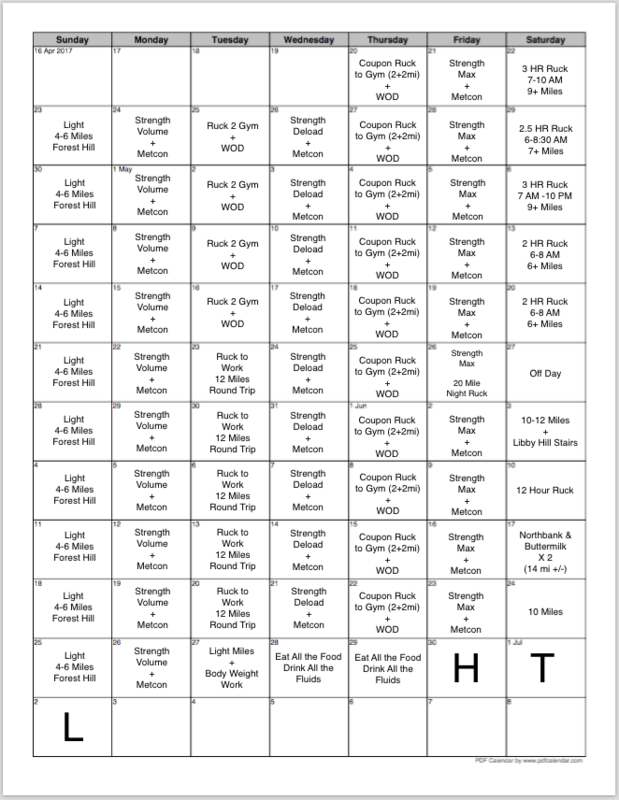 But, the plan basically continues my M,W,F strength training and metabolic conditioning, while adding some weekend rucks that are longer. If you have any questions about the plan, drop them in the comment section. 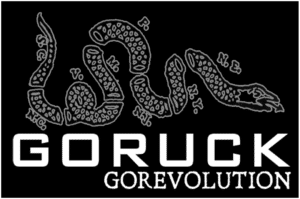 A lot of GORUCK for me is learning and growing. In all my previous events there are lessons I’ve learned (aka, ways I screwed up) that helped me in my next event. I believe my previous HTL failure will help me in the same way. In particular, I think knowing what it feels like to complete a Heavy will be a big help. To know the mental, physical, and emotional release at the Heavy endex and how to navigate that and begin to prepare for event number two will be a big help. That’s really where it all broke down for me last time. Of course, I have to get to the endex first. For me, it is less about the miles and more about the beat downs. I feel like my last Heavy taught me a lot about the mental aspect of beat downs and how they impact me. I’m hopeful that I can pull on those lessons learned and have a better mental outlook when my body is failing me. I failed my first HTL attempt. It hurt me physically and mentally. But, because of some friends, a coupon code, and a moment of clarity, I’m heading back into the fires of adversity. It is time to put in the work, get my head straight, show up, and put out. I’m looking forward to the event, the team, and learning from Cadre Andy. 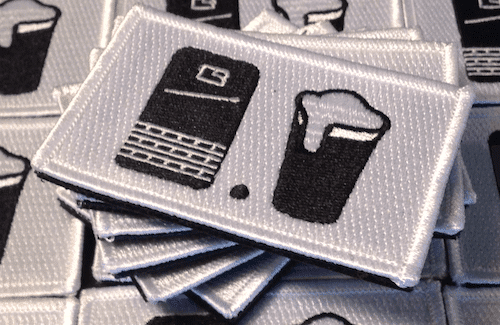 Most of all, I’m looking forward to earning this patch. Click to find an HTL near you. 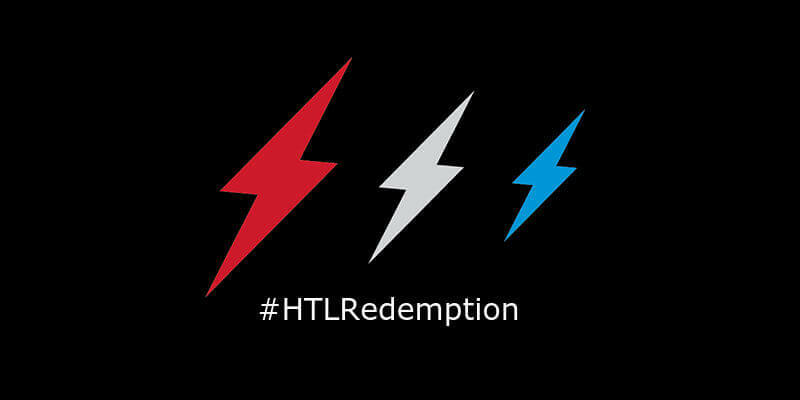 I just signed up for my first HTL. I’ve completed one Heavy. For that I did short rucks through the week and longer rucks on Saturday. I did Crossfit 3 days a week along with it. What else you think should be implemented?